Wallingford Carnival 2013 took place on Saturday 15th June . The theme for the Carnival was "The World of Dance ". We hope this will inspire all of you who take part in the procession to come up with your usual high standard of entries. In 2013 the procession started at 1 pm from Wallingford School travelling along St. George's Road, Croft Road and pass through the Town Centre en route to the Kinecroft at about 2:00pm. The 2013 procession was organised by Style Acre. If you are interested in entering the procession you can find out more by Clicking Here. 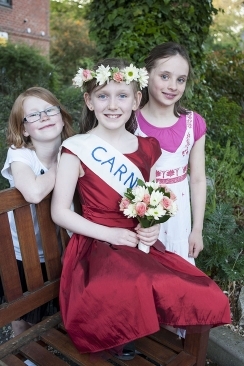 The Carnival Princess was chosen on Saturday 25th May in the Function Room of the George Hotel. 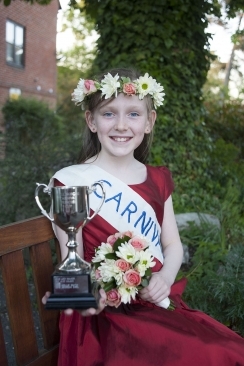 Entrance to the competition was open to residents of Wallingford & District and aged between 8 & 11 on the 15th June 2013. Carnival Raffle Tickets are on sale from early May and programmes will be delivered to all homes in Wallingford with the "Window for Wallingford" publication. The Rolling Stones Now - tribute band. Thanks are due to Paul Simmonds of Simmonds Removals for his very generous sponsorship of this band. There will also be great food the raffle will be drawn before the start of the evening's entertainment. In 2013 the stalls were on the Kinecroft.